Margaret Murray Jackson (nee Campbell) was born October 12, 1918 in Port Edward, BC. 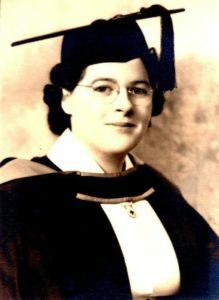 In 1936 she enrolled at the University of British Columbia, and the following year applied for entrance to the Vancouver General Hospital School of Nursing. She completed a three year nursing program at the Vancouver General Hospital in 1941, graduating the following year from UBC with a BSc. degree with a major in Nursing. In 1949 Margaret was one of the first nurses from British Columbia to acquire an MPH (Master of Public Health) degree, through the University of Michigan. During the late 1940s and early 1950s, Margaret held several positions in the British Columbia Public Health System, including Staff Public Health Nurse (PHN); Supervisor; Assistant Director; and PHN Consultant in the Kamloops-Lilooet-Ashcroft area, 1948 to 1954. In November 1954, Margaret began working with the World Health Organization. She was stationed as a nurse in Tehran, where she became a Nurse Team Leader, training nurses in administrative duties. She left Tehran in November 1956. Upon returning to Canada in 1957, Margaret began a career as an instructor of classroom and clinical Public Health Nursing and Statistics at the University of Alberta's School of Nursing. In 1966 she married Walter Jackson. She passed away in Edmonton July 3, 2003. Fonds consists of fourteen centimeters of textual records, fifteen photographs, and other material relating to Jackson's education and nursing career dating from 1927 to 2003, although most are prior to 1987. It includes material relating to her education at high school, the University of British Columbia, the Vancouver General Hospital school of nursing, and the University of Michigan. Other documents relate to her experiences as a Public Health Nurse and her work in Iran on behalf of the World Health Organization. Records concerning her activities in Iran include appointment and payment records, congratulatory correspondence from the BC government, photographs of Margaret, correspondence to her family detailing her work and other daily activities and experiences, correspondence from a friend also working in Tehran, and other documents received in Iran. Types of material include correspondence; diplomas, transcripts, examinations, certificates, and other documents; papers and speeches; a scrapbook, programs, and other memorabilia; photographs, and an audio cassette of her memorial service. One file contains records related to this service held for her at the University of Alberta faculty club June 17, 2003.